North Logan, UT – Ophir Photonics Group, a Newport Corporation company celebrating 40 years of excellence as the global leader in precision laser and LED measurement equipment, has announced a new training tool for BeamGage®, the laser beam profiling system. 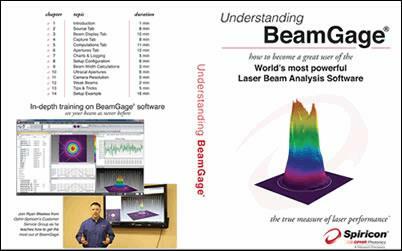 "Understanding BeamGage: The BeamGage Training DVD" provides an in-depth look at how to get the most from your laser using this powerful analysis software. Presented in 14 video chapters, the training covers the features and power of BeamGage. Topics include Ultracal™, the baseline correction algorithm that helped establish the ISO 11146-3 standard for beam measurement accuracy, camera controls, integrating Ophir power meter measurements, displaying 2D and 3D profiles, charting and graphing, and statistical measurements. Also included are tips and tricks on how to get the most from BeamGage. BeamGage is a state-of-the-art beam profiling system that performs extensive data acquisition and analysis of beam parameters, such as beam size, shape, uniformity, divergence, mode content, and expected power distribution. The system can analyze different light sources, from lasers to LEDs to optical fibers, compare key statistics, and provide 3D viewing in real-time. BeamGage includes more than 55 measurements and calculations, many based on ISO standards. These include fast, off-axis correction of distorted beam images; trend charting; data logging; power/energy calibration; and pass/fail production testing. The Custom Computations function allows importing of user-generated custom algorithms created in C# or .NET. BeamGage supports a wide variety of CCD cameras, including the 11 megapixel, 35mm format USB L11059 Large Format Beam Profiling Camera. Understanding BeamGage®: The BeamGage Training DVD is available now for US$295.